Since the 1800s vast opencast sites, quarries and mines have been created for extensive extraction of sand and gravel, stone and minerals like coal. Some quarries are removing entire hills, using the crushed rock for major construction projects. Others are taking masonry for major new buildings or repairing historic structures. Mines used to produce lead, copper, barytes and zinc. West of Edinburgh shale was extracted for its oil content, the waste shale being piled high, leaving characteristic red shale bings around the mineheads. Once no longer economically viable or worked out these sites, some with large areas of waste tips, have been abandoned, becoming rough grazing or moorland. Some areas have been restored, landscaping the tips and associated ground for modern use, either as farmland or as recreational areas of open spaces, wetlands and footpaths. 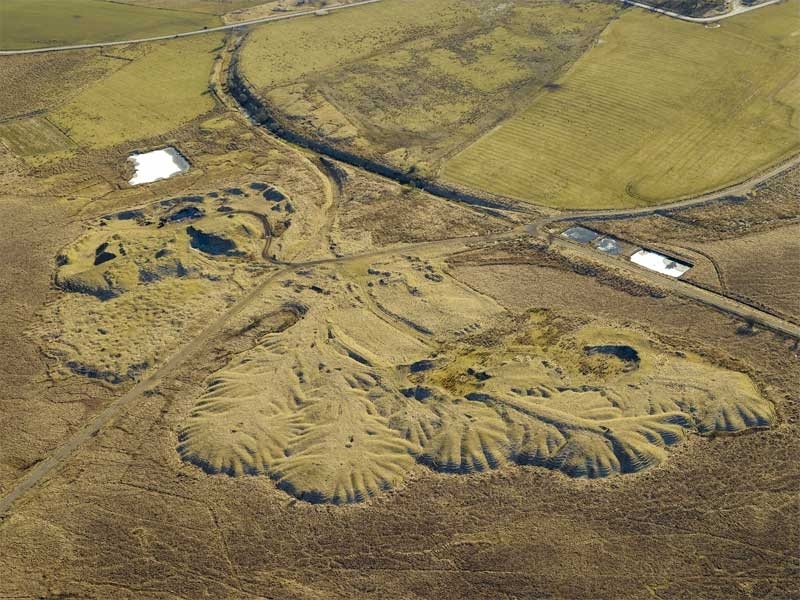 This grassed over bing at Common in Ayrshire is the remains of a coal mine which is depicted on historical OS maps. All eras of aerial photography are used to identify the extent of mining sites.